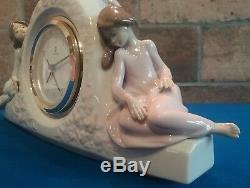 LLADRO TWO SISTERS CLOCK- 5776. 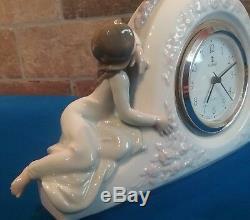 This is a magnificent clock from Lladro that was first issued in 1991 and retired in 2002. This is quite unique as it comes with its original stained wooden base. 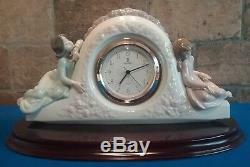 It is in excellent condition with no chips, cracks or restoration and comes with its original Lladro clock. It takes one standard AA battery but due to postal restrictions. It stands approximately 16.5cm high and is approximately 32cm in width. All white dots/blotches are light reflection. 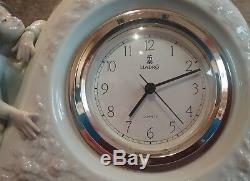 The item "Lladro Two Sisters Clock 5776 WORLDWIDE FREE POSTAGE" is in sale since Wednesday, December 5, 2018. This item is in the category "Pottery, Porcelain & Glass\Porcelain/China\Lladro/ Nao\Figures". The seller is "crysdel-105" and is located in Paddock Wood.